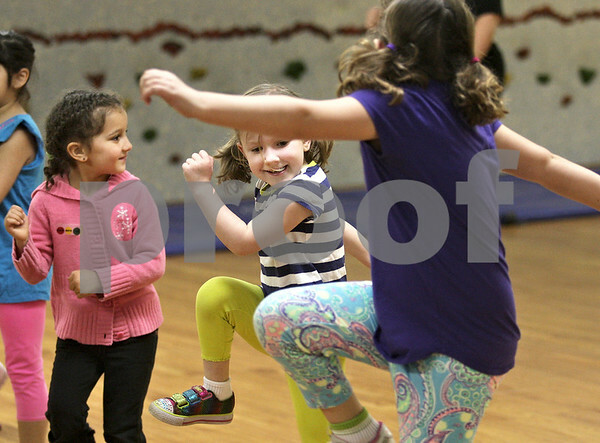 Molly Fell (center), 5, looks to her sister, Anna Fell, 7, while they learn zumba moves in a Zumbatomic demonstration class during Healthy Kids Day at the Kishwaukee YMCA on Saturday, April 27, 2013. The event was for kids in the county to get up and get moving as part of a national YMCA movement to promote healthier lifestyles for children. The event featured educational and physical activities such as games for families, bounce houses and a bike rodeo.